​ and this fine lady has made us proud! Rosie garnered a Top Ten in the SE 3 year old Fillies. She looked great and rocked the show ring! Thank you to Bryan Jeffries and his staff at Jeffries Arabian Center for everything! 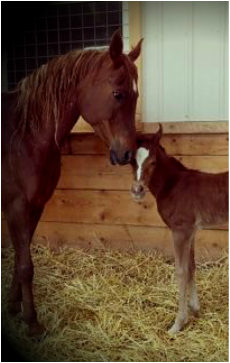 Pash gave us another beautiful filly! This is the third daughter she has given us. Sired by *El Zilal Tamar. Pash is such an amazing mother and producer! Mereeka produced a beautiful filly for us! Mereeka is such an amazing mother! This filly has such great potential! The wait is over! A filly! EAI Jamiqaa produced a filly after three boys in a row! She is a beautiful mare, an excellent producer and mother! ...and now we have a daughter to carry on her bloodline. 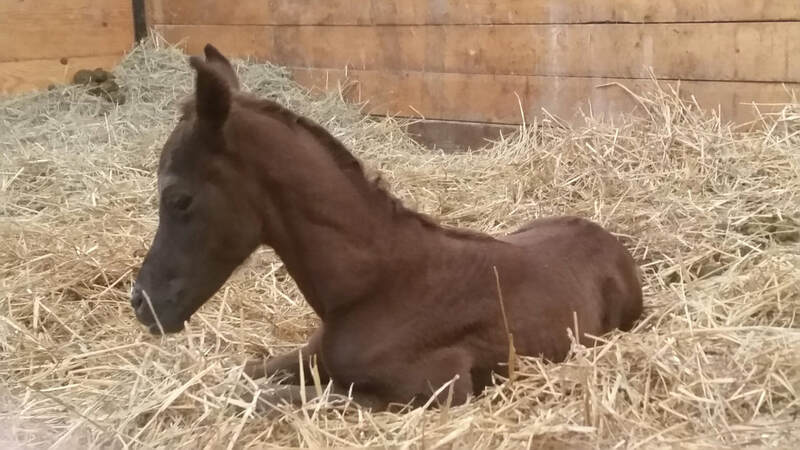 The first filly of 2018! One beautiful filly with an amazing set of legs! This beautiful colt has amazing movement! This colt is a very unique combination of bloodlines! ​We want to take a minute to say thank you to Alicia Midgett and Iban Trivino of Nasmat Egyptian Stud-Colorado! We can not say thank you enough for allowing us to lease their beautiful stallion, *El Zilal Tamar, in 2017! We are so excited for the foal crop in 2018! Pash Maajmala has given us another beautiful filly by PWA Nagib Shah! ​We can wait to see how this fine lady matures... We hope she follows in her sisters foot steps! *Simeon Sochain is the proud father of a beautiful filly! ...out of a daughter of Nabiel. ...out of a daughter of Moniet El Sharaf. ...out of a daughter of Kayed. ...and then the filly is by *Simeon Sochain! Can we say a "royal" pedigree? *Simeon Sochain is the proud father of a beautiful colt! The summer of 2015 has been an exciting one...and very busy! We are excited because we have foals on the ground by all three of the senior stallions here at the farm. We have foals on the ground by PWA Nagib Shah and Imtaarif's Heir. All three boys did a very nice job for us in 2015. We have decided to make a couple of the colts available that were born...only because we just don't have enough room for a bunch of boys right now. We are going to be offering some nice deals and considering offers just due to the lack of room for the boys. We have been working on our breedings for 2016 with much anticipation! We hope everyone's 2015 breeding season has went well! CEA Nefertiti has produced a beautiful upright filly with a beautiful dished head. Her sire is our Imtaarif son, Imtaarif's Heir. This filly looks to have such a promising future! We love this new generation of our breeding program! EAI Jamiqaa blessed us with a beautiful colt by PWA Nagib Shah! The colt is very animated, upright and showy colt with a beautiful long arched neck, a pleasing head with large eyes and excellent tail carriage. We can't wait to see how this colt matures! Jamiqaa is such a great producer and mother! 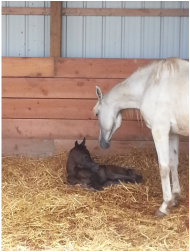 Congratulations to my parents on their first foal being born! A filly! What a great start! She is a stunning gray filly out of Pash Maajmala and by PWA Nagib Shah. She combines the blood of Ansata Ibn Sudan, Falima, Nabiel, Ansata Halim Shah, Prince Fa Moniet, *Ibn Al Hassan+/...and on and on...and this filly shows it! What a graceful mover! I don't think she has "hit the ground" yet! Thank you to Dr. Kubiak as well as Bryan and Melinda Jeffries for sharing their knowledge! EAI Jamiqaa and Nagib produced a very special colt this year! This classy colt has great conformation and type. He has a beautiful head along with huge eyes! We can't wait to see how this colt matures! His pedigree is packed with many, many of the "greats". What an amazing opportunity at the Egyptian Event Gala! What an awesome opportunity to meet Her Royal Highness Princess Alia Bint Al Hussein of Jordan and Peter Upton-a famous painter from Britain! What a neat experience! Thank you to Majid Alsayegh-an accomplished breeder and wonderful person-for introducing us! Also pictured Susan Gilbert of Sumerlan Arabians. I will always treasure this experience! Congratulations to Abdulal Al-Qenaei of Kuwait on the purchase of Nefertari CE! Best wishes to Nefertari and her new owner! What a year to remember! Our Ansata Halim Shah son, PWA Nagib Shah, was named Champion Stallion in the 10 & older stallion class at the 2010 Egyptian Event! And his daughter took Top 10! What fun we had! Even though Nagib was 16 years old he still showed them he was all that! 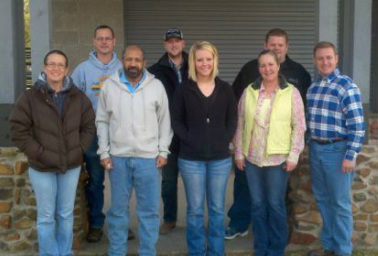 Thank you to the Bryan Jeffries and the Lyday Farm staff for doing such a great job with our horses. Nagib's daughter, Nefertari CE, also garnered a Top Ten as a young mare at this show! What a fun Egyptian Event!